Double Bonus is a variation of Jacks or Better poker, but you get double the award for any four of a kind. Of course, this affects the overall payout and also the profits that can be made from other hands, which are reduced to make up for the bonus. What exactly is Double Bonus Video Poker and how it compares to Bonus and Double Double Bonus Poker? 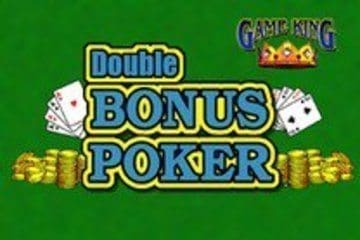 In order to explain Double Bonus Video Poker, we will need to start with defining Bonus Poker, which is a Jack or Better Video Poker variant that pays bonus amounts for Four of a Kind hand. The payout rate is determined according to the rank of the cards and not all combinations will have the same payout value. For example, Four of a Kind with all Aces will have a payout value of 80 to 1, 2s, 3s and 4s will pay 40 to 1, and all other Four of a Kind hands pay 25 to 1. In Double Bonus, the payouts for Four of a Kind are increased by 2. On the other hand, to make up for the doubled payouts on one side, Double Bonus variant is decreasing payouts on Two Pair hand, reducing 2 to 1 payout rate to even money. This has also affected the volatility of the Double Bonus variant and resulted in a game that can easily go both ways – generating a massive winning or draining your budget in a relatively short time period. Double Double Bonus Video Poker goes an extra mile and doubles the already doubled Four of a Kind Payout rates while keeping the even payouts for the Two Pair hands. Some of the strategic rules that one has adopted over time, especially by playing Jacks or Better, might not be applicable when playing Double Bonus Poker. For instance, let’s say that the player holds a Full House, which in some other Video Poker variants is not the kind of hand you would want to split. In Double Bonus however, keeping the Aces and getting rid of the extra pair is what most of the experienced Video Poker players would do, due to the high payout rate that one might win if the fourth Ace is drawn. Another common mistake that a lot of beginners make in Double Bonus is keeping a low pair on a Straight and a Low Pair hand. For the sake of illustration, let us assume that the player has a hand consisting out of a pair of 8s, a Jack, a 9 and a 10. In this case, the player should hold onto four consecutive cards – 8, 9, 10 and Jack – which can result in a Straight Flush and pay 50 to 1 as oppose to the 25 to 1 payout odd for a lower pair. Where to play Double Bonus Video Poker? Boyd, Plaza and The D are only some of the venues offering Double Bonus Video Poker machines, which, thanks to their high volatility, are much easier to find than Jacks or Better. When you play for real money in a casino, you probably want to study the tactics in a bit of details, because it requires a specific strategy that is different from the regular games of video poker, like Jacks or Better. For this reason, a lot of players would stick to games they know and love (and know how to play optimally) like Jacks or Better or Deuces Wild. Because you get a much higher payout for 4-of-a-kind, the wins are reduced for lower hands. This makes the game far more volatile and you could go for long periods without winning much money, then suddenly hit a couple of 4 of a kind hands and find yourself up big time. So, the Double bonus game is generally better for pros than for amateurs.